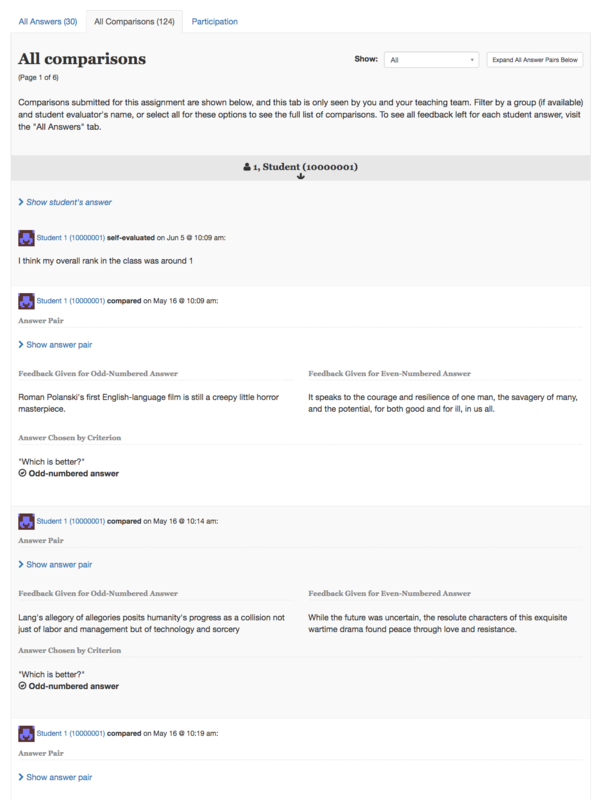 Using ComPAIR for peer review on a basic level is a straightforward process. Instructors post an assignment; then students answer, compare, and comment on pairs of peer answers; and finally, everyone views results. On the administrative side, instructors set up five structural elements for each assignment, a process that can be completed in under ten minutes. The short title of the assignment and any additional details, which can be included in an attached file, rich text, or both. Instructors can also enable group answers/comparisons and a self-evaluation. The timelines for when students can a) answer, b) compare answers and, optionally, c) evaluate their own answer. By default, comparing begins after answering ends, though these may be designed to overlap. The question(s) students respond to in comparing answer pairs. The default is "Which is better? "; however, instructors may change this to suit learning outcomes. Any number of criteria can be used, with a minimum of one per assignment. Each criterion must pose a question answered by choosing between two answers and this can optionally be presented with a detailed explanation. Instructions for peer feedback and self-evaluation can also be customized, though the inputs for students for these activities are restricted to a single, multi-line text box. The number of answer pairs students will compare and how the pairs will be selected by the application—at random or adaptively based on how students have ranked answers so far (learn more about adaptive selection and scoring). Instructors can also add a practice answer pair for students to complete prior to comparison of peer answers. The weight given for completing each part of the assignment. When registered students log in, they can see all active assignments for a course and select the assignment they wish to answer. When answering, students can use rich text, a file attachment, or both. 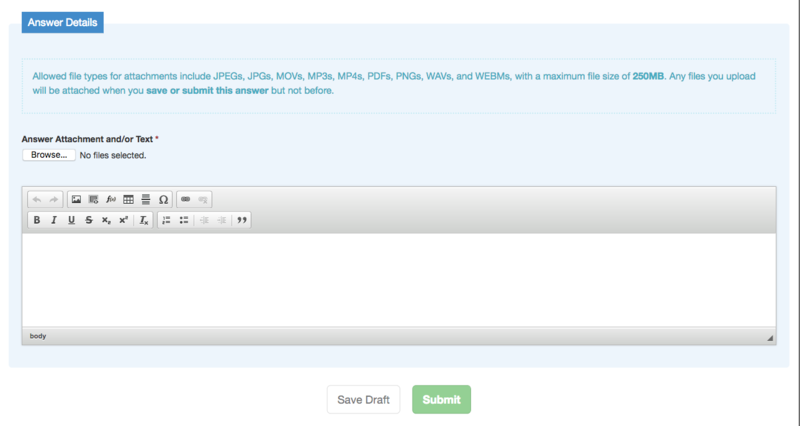 Instructors and teaching assistants may also submit answers of their own for assignments (and optionally include these for comparison with student answers) or upload on behalf of a student (e.g., if a student misses the answer deadline). After answering, students compare pairs of peer answers. Each pair is considered a "round". A round starts with students selecting a preferred answer from the pair for each instructor-set criterion. Then students write feedback to the author of each answer, using instructor-set instructions. At the end of each round, students submit their criteria selections and feedback together. After submitting, they are automatically directed to the next pair of answers until they have completed the required number of comparisons, though they may leave and return to the work at a later time. If instructors enable self-evaluation, students are asked to evaluate and comment on their own answer at the end of the process (or during the custom dates chosen), again using instructor-set instructions. 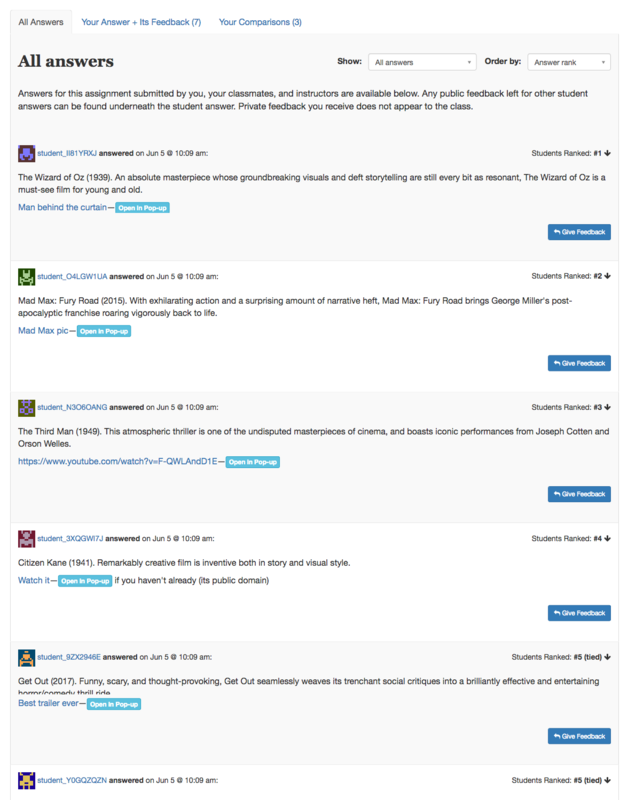 Once the assignment completes, students can access the peer feedback given to their own answer, as well as the full list of answers submitted by their peers. Depending on how instructors set up the assignment, students may also see the answers ranked most highly by their peers (if scoring is used, though the scores are always hidden from students) and/or answers marked as "top" answers by instructors or teaching assistants. Instructors and teaching assistants always see the full list of answers, with normalized scores if scoring is used (learn more about scoring). 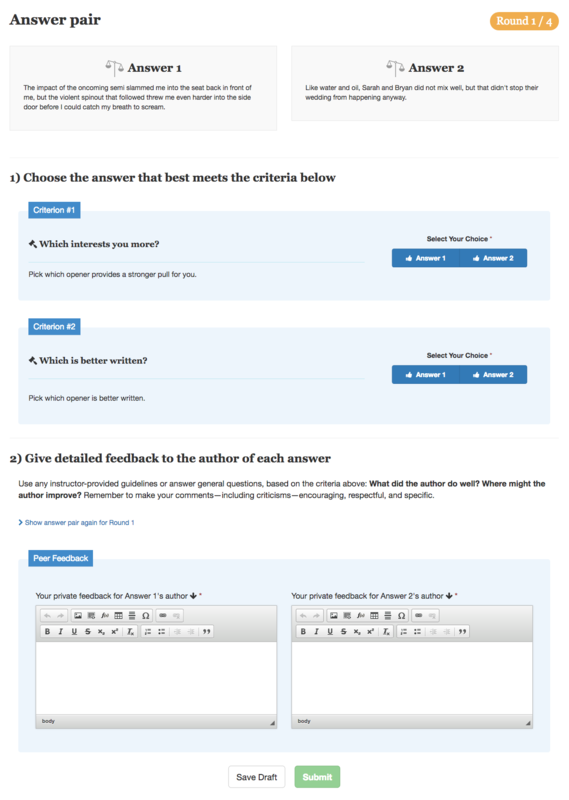 During and after an assignment, instructors and teaching assistants can read and comment (privately or publicly) on student answers, access a participation table to view activity and participation grades, mark "top" answers, and view each student's comparison outcomes and peer feedback for the answer pairs (as well as the self-evaluation, if enabled).